Great site! I just want to meander over, grab a box of junior mints and an ice cream cone and watch the show! RC makes me think of words like meander and mosey. ooh amble Well, what do ya know? Theres another. AmbleNeed an email where I can reach you fine people. 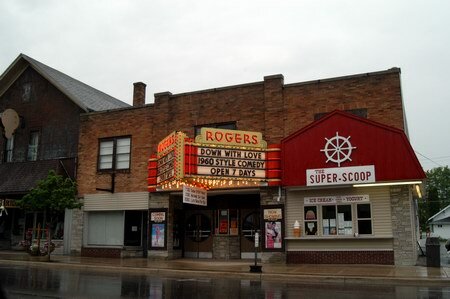 During 2008, the facade of the Rogers City Theater will be restored to conform more closely to its original 1937 Art Deco style. The red barn roof left over from a past Dairy Queen franchise will be removed, and the vinyl siding will be replaced with glossy black tile, to bring the building front closer to the clean modern style seen in early post card views. 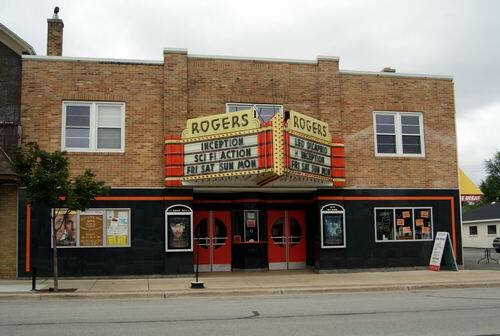 During 2007, a new roof was installed on the theater, and the heating upgraded to more fuel efficient hot water system. This should help the place last another 70 years. First run movies are still being shown. Live productions sheduled for 2008 include Little Shop of Horrors (April), Alice in Wonderland (August youth theater) and Pajama Game (early November). 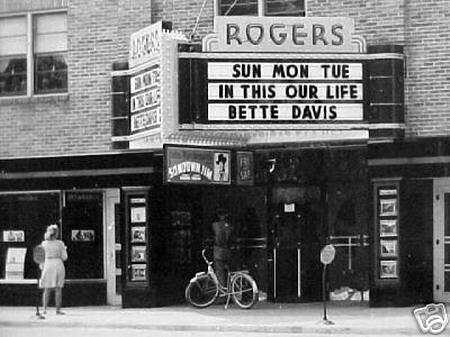 I used to go to this theater all the time back in the early 90s when I lived in that horrible little town. It was my one escape from the backwards life that is northern Michigan. Great place to visit but I do not suggest living there. I only wish the current owner owned it when I lived up there instead of Mr. Vogelheim because the winter months were long and boring without my movies. I am glad to see it still going strong and wish them all the luck with the new stage. Maybe next time I come to town I will check it out. 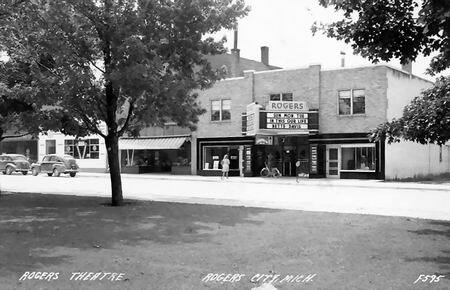 Originally opened in 1937 - Partially destroyed by fire in 1947 - Rebuilt and remodeled in 1948. 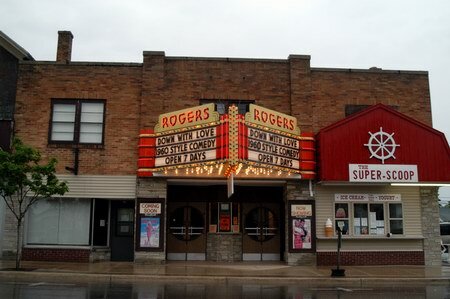 Restored to original decor in 2003, but with addition of a stage for live theater, and upgraded electrical, heating, and handicap accessible rest rooms. Now operating as a 424 seat, big-screen, downtown movie theater year round, with occasional live theater, concerts, travelogs, and other functions. 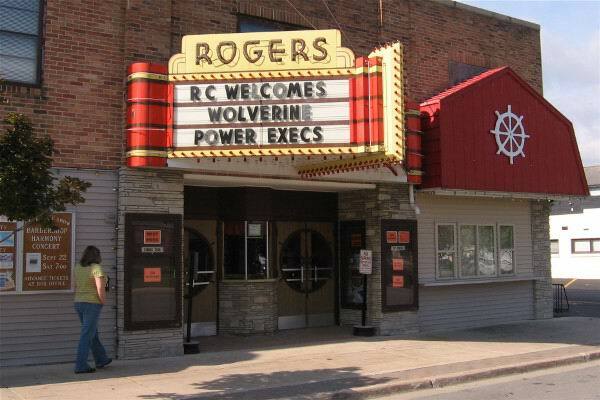 The Rogers is a fantastic downtown theatre that is very well maintained with a good sized screen and good sound. 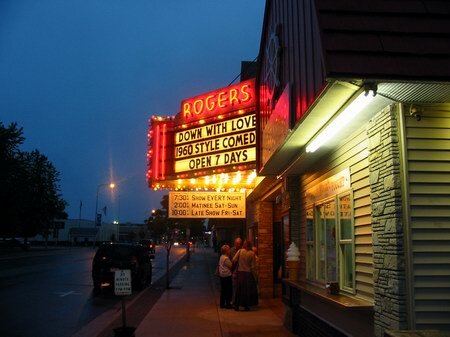 One of the best downtown theatres in the state.